1964 was a very good year for the-then young Marvel Comics Group. By then, already a hopelessly devoted fan of Stan Lee and Jack Kirby, I had no problem working up enthusiasm for anything they did. 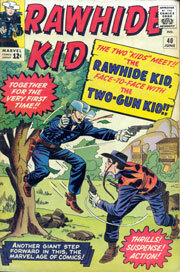 Even, as it turned out, teaming up two of their Wild West gunslingers! 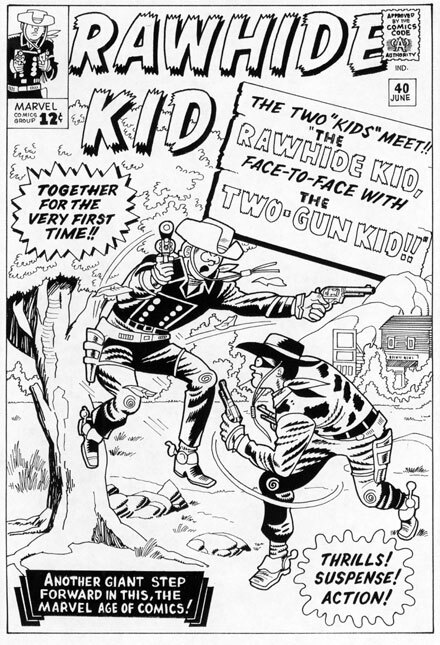 Okay, sure--as things went in the Marvel Pantheon, Rawhide Kid and the Two-Gun Kid were several steps--make that a couple whole floors--below the likes Spider-Man and the Hulk,but somehow this cover made the prospect of this pair of marginal members of the ever expanding Marvel Universe meeting for the first time seem tremendously exciting!